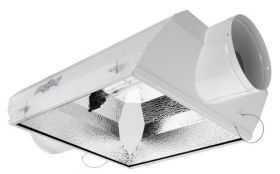 The patented sealed optic technology allows removal of heat generated by the lamp without cooling the lamp. Made specifically for double-ended horticulture lamps (not included). Features German made, UL listed double-ended sockets. Unique double-ended construction allows for maximum optical efficiency and uniformity. Improved spectrum DE lamps used in this fixture focus on the red component for increased photosynthetic response. They offer improved PAR values and increased PAR/lumen maintenance (up to 90% PAR at 10,000 hours of operation). The AC/DEs patent pending design allows removal of heat generated by the lamp without cooling the lamp below proper operating temperature. 95% reflective textured German aluminum interior with 98% reflective corner inserts offer excellent uniformity, output and diffusion. Galvanized steel housing with durable powder coated finish. Manufactured with exacting standards. It features double gaskets (between glass & reflector and glass & frame) for an air tight seal. Hinged glass makes changing lamps and cleaning glass easy. 15 ft detachable lamp cord. Comes with built in level for easy, consistent, level hanging. US patents: D698,987, D698,628, D737,498, D726,116, D771,301, D755,722, 9,016,907, 9,335,038. US Patent Pending: 29/579,733, 29/558,123, 29/550,672, 14/701,134. Chinese patents: ZL201330634881.9, ZL201330642281.7. Foreign Patents Pending: 14825888.2 (Europe), 201530400236.X (China), 2014290774 (Australia), 16111238.1 (Hong Kong), 2918776 (Canada).